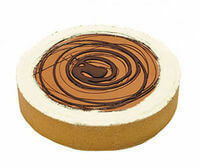 A tempting blend of cream cheese, honey and hazelnut milk chocolate, creating an irresistible smooth texture, chilled perfectly in a biscuit base, finished with a dark chocolate swirl. 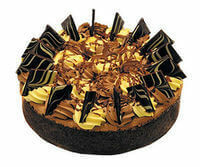 A smooth and creamy white chocolate cheesecake with chocolate chip cookies baked in a chocolate biscuit base and decorated with mousse and chocolate chards. A mixture of white milky chocolate, generous amounts of Baileys, a hint of butter- scotch and enriched with fresh grounded coffee. 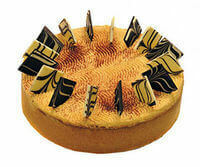 It is baked to perfection in a golden biscuit crumbed base, garnished with dark and white chocolate chards. 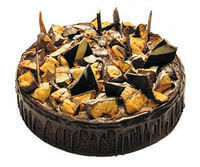 A chocolate biscuit crumbed base baked with chocolate and caramel mix, topped with mousse and an abundance of honeycomb pieces. 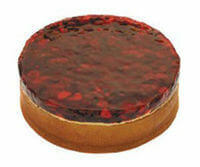 A smooth, creamy New Yorker style lemon baked cheesecake, cooked in a golden shortbread base, then topped with a generous layer of fresh wild berries. Choose from: Strawberry, Mango, Lemon and Manhattan Cheesecakes. 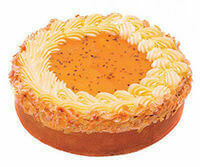 A traditionally prepared rich, creamy baked cheesecake, enclosed in our tasty shortbread base, then decorated with cream cheese and almond flakes with passionfruit pulp syrup.